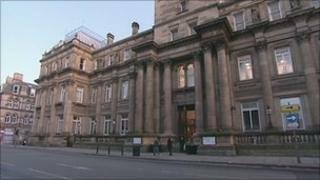 Liverpool City Council says local government spending figures show it will be hit the hardest in the country, with more than half of the council's senior managers set to go. Forty-eight out of the 74 posts are going to be axed, which the council said will save up to £4.25m. The government revealed the council is among those receiving the highest rate of cuts - 8.9% over the next two years. The council estimates it will lose £100m over the next two years. City Council leader Joe Anderson said: "We have been hit harder than every other city - despite having some of the most pressing needs in the country." He added: "The coalition's cuts will have a severe impact on our ability to attract new jobs and investment to the city. Today will go down as a very bleak day for Liverpool." There will also be salary cuts to high-earning roles. The chief executive's salary will drop from £203,500 to £197,500. Directors will find themselves earning an average of £130,000, £30,000 less than their current wage. Several senior managers have taken voluntary redundancy while others will have to apply for other jobs across the council, a spokesman said. Mr Anderson said: "I have always said that when it comes to cutbacks, they should start at the top. "The scale of the cuts the council is facing following the loss of millions of pounds of government grants will affect every service we provide, and every penny we have must be spent on protecting essential services and not wasted on needless bureaucracy. "Quite frankly, the city council has suffered from a top-heavy, bloated senior management set-up, weighted down with too much paperwork, form filling and box ticking. "These radical changes mean we will have a much leaner, more efficient team of managers that will be 100% focused on delivering the council's priorities." Liverpool has the highest concentration of deprived areas of any local authority in England, according to research commissioned by the BBC in September. The study by Experian ranks England's 324 councils by their resilience to economic change and there are fears that Liverpool could be one of the areas to suffer the most because of the cuts.